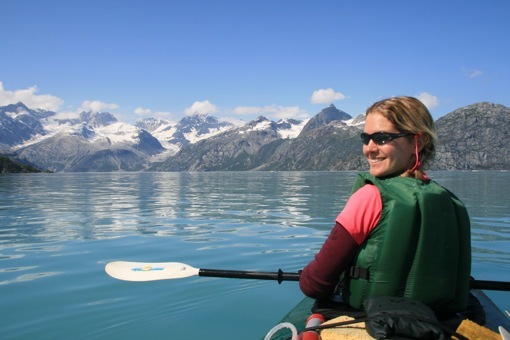 We were dropped off at Queen Inlet in Glacier Bay by the MS Fairweather, 100 miles from civilisation, together with our double kayak and camping gear. 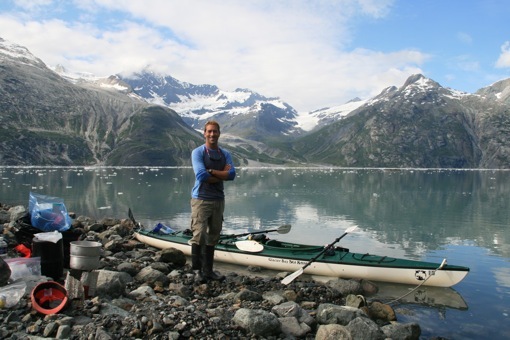 This was the start of a 5 day kayaking trip around the west arm of Glacier Bay. DId I mention that 5 minutes before we were dropped off, we all watched a sow brown bear & her two large cubs chase another brown bear up a cliff at speed? 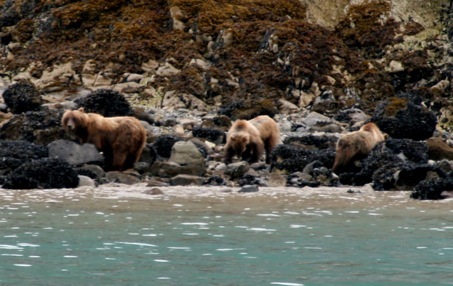 And that the coastal brown bears are larger than grizzlies & black bears? And we were effectively on our own out there? The initial adrenaline kick was something else! The other guests on board the Fairweather were very glad to be staying on board I am sure. We loaded up the kayak, everything in drybags against the promised rainy weather, and after a few false starts (watch left behind) and checking for bears, we set off into the West Arm. A couple of hundred yards paddling settled us down a bit and we looked around us a bit. Amazing scenery. 250 years ago this whole “up bay” area was covered in glaciers, which are all in retreat except one or two. Cold green glacial waters, high craggy mountains rising up out of them, snowy caps and lots of ice. 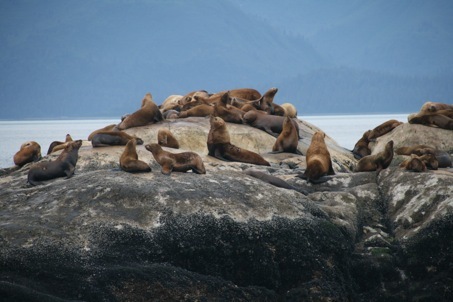 Bears were not the only issue – we also had to watch out for cruise ships (2 per day into the inlet), other small boats, and the significant tidal fluctuations. We had so much to think about! We headed up bay towards Russell Island, hugging the coast, and calming down. As evening approached the next challenge was to find a campspot for the night. 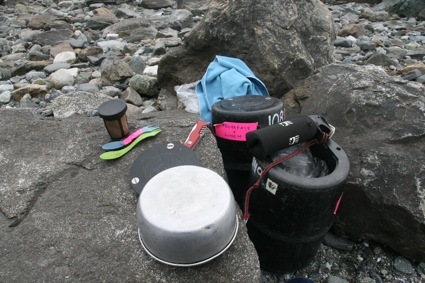 We had a checklist – above the high tide mark, reasonably flat, enough space for a bear to pass either side easily, not near a river where bears are fishing for salmon, away from berry patches, sedge grass or narrow beaches. What on earth is sedge grass anyway? With all those things to watch for, it took a few tries to get a spot. We found one half way down the island, looking over at Reid Inlet & its glacier. The thing about bears is not to surprise them, so the rangers had said to talk loudly when landing, heading around corners, getting out of your tent, and when generally on land. So, this we did with vigour. We kept up ridiculous monologues when heading up the beach, sang songs and had a lot of silly conversations. All this while constantly scanning the beach for activity. Any local could spot us bear novices a mile off! So, we nailed a campsite, managed to have a beer and eat dinner, have a small fire and get up the courage to get into the tent! To complicate things, we had to wake up at 2am to check that high tide wasn’t going to swamp our tent! So, not much sleep for us! We woke to a bluesky day, couldn’t believe it. The kayak rental company had practically promised constant rain, so we were delighted to see the sun lighting up the snow caps and glacial waters. We cooked up starbucks espresso roast and had breakfast – cinnamon & apple oatmeal. Not a bad start! We congratulated ourselves on surviving the night! A lazy morning was in order, this set the pattern for the rest of the trip actually. We packed up and headed accross the open water to the otherside of the inlet. 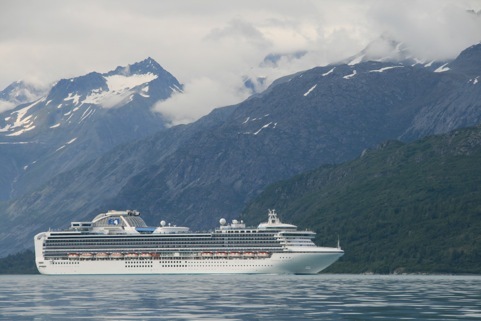 This involved monitoring a cruise ship’s movements, and trying to judge which route it was going to take. Luckily we managed to gauge correctly and avoided it. We paddled around the corner and Lamplugh glacier came into view. Our first close up, and our first encounter with small icebergs. 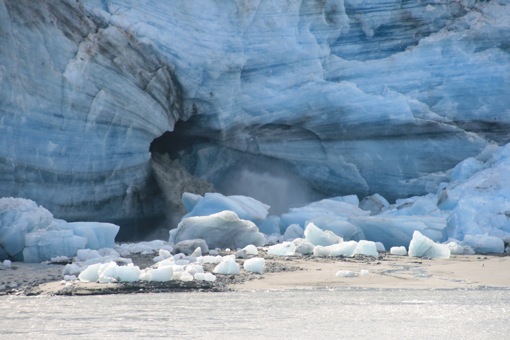 Thel glacier had a roaring river coming out of an ice cave, which turned the water a dirty green colour with its silt. Nevertheless in the evening sun it was stunning. 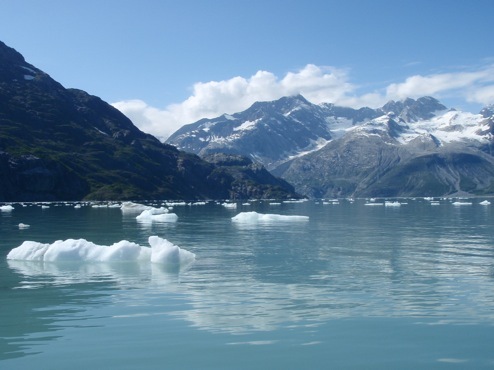 We carried on up Johns Hopkins Inlet to see the jewel in the crown – Johns Hopkins Glacier. The whole bay was full of floating ice, sculpted to interesting shapes as it melted. We could hear the glacier calving in the distance. Other glaciers lined the walls of the valley. 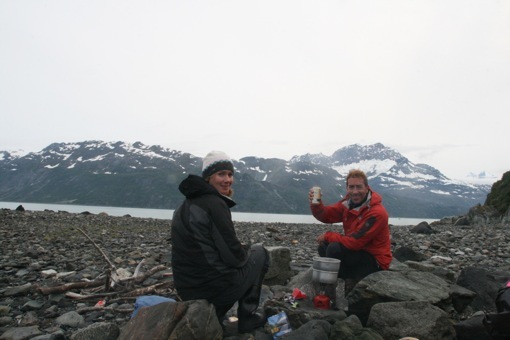 We stopped at the base of a moraine to have some lunch – sharing our spot with some oystercatchers and curious seals who had followed our kayak. It was amazing – worth the stress of the bears! That night we camped on a beach with another group – I think we both needed the reassurance of other people to have a good night’s sleep. 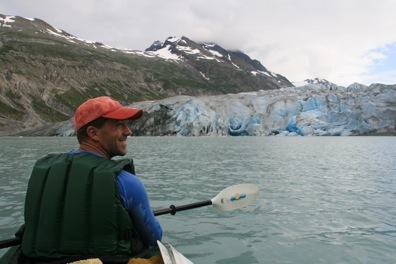 The next day, after contemplating and dismissing cutting the trip short by one day, we kayaked along the coast and into Reid Inlet, to inspect Reid Glacier, check out the wildlife and enjoy the day. 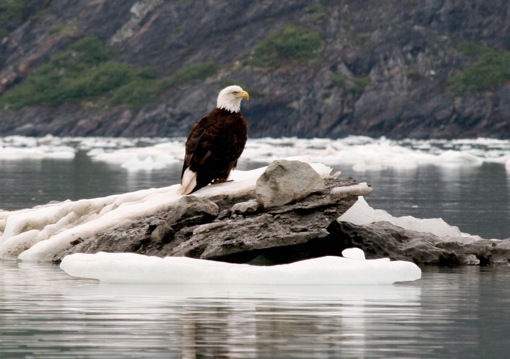 Bald eagles were a highlight. We commented that seeing bears from the safety of the water would be great – but we saw none. 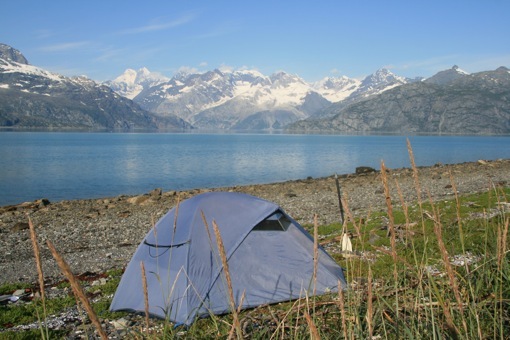 We set up camp that night at the tip of Russell Island, unfortunately beside a wild strawberry patch, but we didn’t really have much choice. Again it had been a lovely day and we had a lovely sunset to enjoy in the evening. Nothing would have kept me awake that night – poor Cathal took the brunt of reading into all the island night noises! Our final day was a trip back to near the pickup point. We dealt with some rough waters, but the wind was at our back. 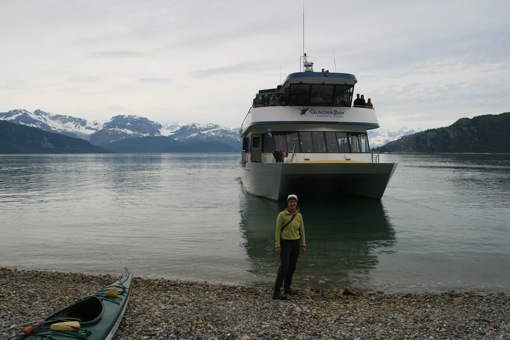 Our final treat was a trip up Rendu Inlet, with two glaciers at the end. The water was glassy calm, and there was nobody else there – motorboats not allowed. The glaciers winked in the afternoon sun. Our final campsite proved interesting – at about 2am we both woke to the noise of something big & heavy running by outside – a bit like an SUV on four paws! It had to have been a bear. We reasoned that it came out of the bush, saw the tent, got a fright and ran away. 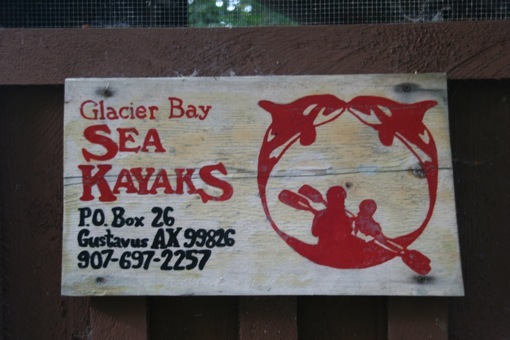 Luckily it made no reappearance – we heard stories of bears letting people know that it didn’t want them around, by smashing their kayaks or tearing apart equipment! The next morning, we packed up for the last time, and headed to the pick up point. We just had time for some coffee before being picked up by the Fairweather. We loaded up the kayak and our gear, and climbed aboard. We both felt the adrenaline flow out of us, it was so great to relax and be back on the boat! It had been an amazing trip, but being constantly alert definitely takes its toll! 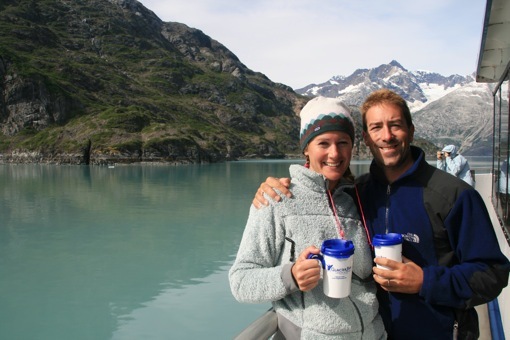 We had a great trip on the Fairweather – it is a tour in itself. 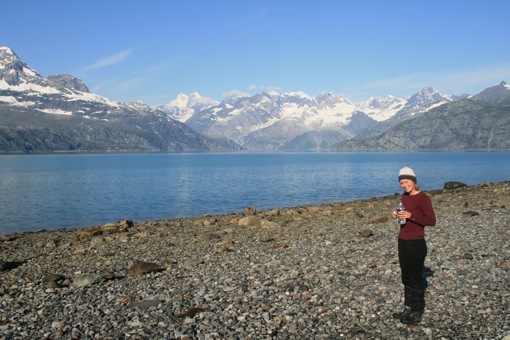 We retraced our steps, and got very close to the Johns Hopkins Glacier, which calved magnificently while we were there.